When is the spine unstable after trauma? Blue is an 11 year old, male neutered Shih Tzu, presented to us five days after an accident when he was run over by a bicycle while walking on the lead in a park. Blue became progressively unable to walk the evening of his accident and had remained paraplegic since. Spinal X-rays in two planes (see image 1), taken at the referring vet, only revealed narrowing of the L1-2 disc space with no evidence of spinal trauma. It was unsure whether Blue could voluntarily urinate or not because he had not been witnessed passing urine voluntarily since the accident. On neurological examination Blue was non-ambulatory paraparetic with minimal hind limb movements, a panniculus cut-off around L2 bilaterally, preserved spinal reflexes and obvious sensation to pain: when the hind limb toes where gently pinched, a withdrawal reflex was observed accompanied by a behavior response from Blue, turning towards us to manifest that he could feel the pain stimulation. Blue had marked spinal pain on gentle palpation of his spine. His examination suggested a thoraco-lumbar spinal cord lesion around T13. In the face of the traumatic event, a hematology and biochemistry were obtained, which revealed elevated liver enzymes (ALT ~1400 IU/mL and ALP~300 IU/mL) suggesting trauma to the liver. Other parameters were within normal limits with no biological signs of active hemorrhage. A bladder cystometry was conducted and demonstrated normal bladder compliance and contraction after infusion of ~120mL of normal saline, suggesting preserved urinary continence. Advanced imaging was conducted with a 1.5 Tesla MRI under general anesthesia. This revealed mild traumatic disc herniation at T12-13, mild misalignment of T12 and T13, bruising of epaxial muscles around T12-13 extending along the thoracic spine (see images 2 and 3). The spleen was also visible on the scans and we suspected a hematoma (image 4), although a pre-existing lesion was possible. 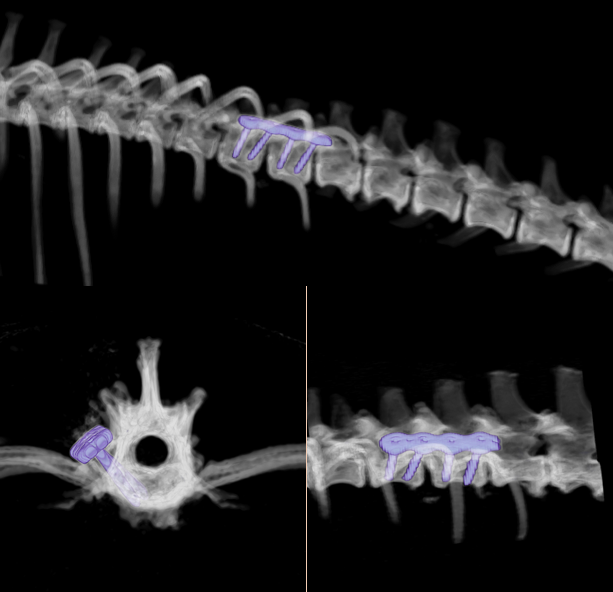 We wished to assess further the bony structures of the spine and a CT of the spine was acquired. This revealed mild sub-luxation of the T12-T13 space (see image 5). The combined MRI and CT suggested rupture of the T12-13 disc plus displacement of T12-13 vertebral bodies, meaning that two compartments of the spine were affected, compromising spinal stability. Blue’s suspected thoracic sub-luxation was treated surgically by, first, performing a mini-hemilaminectomy at T12-13 on the left side to explore the ventral aspect of the spinal canal and decompress the spinal cord (moderate amount of cartilaginous material was retrieved) and, second, placing a 2.4 titanium PAX (locking) plate across T12-13, held by 4 screws (14mm each) for spinal stabilization (see image 6). Titanium implants allows the possibility to re-MRI the spine due the lack of paramagnetic effect from this metal. Blue was nursed within our hospital for 3 days, receiving daily physiotherapy, bladder care and pain management. On discharge, he had mild voluntary movements in the hind limbs but was still non-ambulatory. Ten days after discharge, the owners send us a video of Blue walking on the grass with still a marked ataxia and he was also voluntarily passing urine. He has now, 2 months after the accident, recovered almost fully. Bladder function could be assessed using cystometry and in Blue’s case demonstrated preserved continence, providing crucial information for the nursing team and the owners, but also very good news for Blue. The prognosis after thoraco-lumbar spinal trauma and loss of pain sensation remains poor. However, in the presence of pain sensation, the prognosis is much better and recovery of locomotion is expected, although the gait rarely returns to normal. Overall, recovery is seen in ~50% of cases. Chronic urinary incontinence can occur despite recovery of locomotion. The prognosis after spinal trauma is often slightly worse than it is after disc herniation because the systemic shock that accompanies the trauma probably leads to further ischemic insults to the spinal cord. Image 1: screening spinal X-rays obtained on the day of the accident. Note the collapsed disc space at L1-2, a common finding in chondrodystrophic dogs; the T12-13 space is possibly slightly wider than usual but it is difficult to judge on this X-ray. The dorso-ventral view was not more informative. 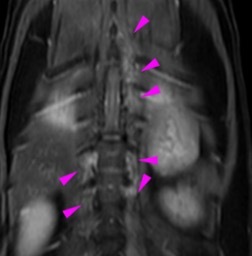 Image 2: at T 12-13, there is material dorsal to the disc space causing moderate spinal cord compression (green arrows). Mild hyperintensity was noted in this material on the transverse T2 and T1 weighted images. No evidence of fractures was visible. There was very mild ventral displacement of T13 in relation to T12 that was likely contributing of the stenosis in the vertebral canal at that level (orange arrow). Image 3: best seen on the STIR images here, there was a poorly defined increased signal in the musculature surrounding the vertebral bodies of T12 and T13. 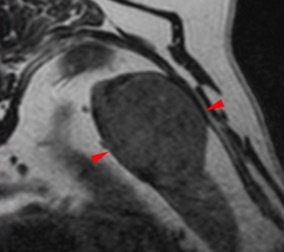 A similar increased signal was noted in the left epaxial musculature up to at least T8 (pink arrows). Image 4: in the included portion of the abdomen on MRI, there was a mass in the left dorsal aspect of the spleen that was mildly hyperintense to the rest of the parenchyma in all the images and could correspond to a hematoma, although other differentials are possible. Image 5: note the widening of the T12-13 space and misalignment of the vertebral end-plates, compared to other disc sites. Image 6: 2.4 titanium PAX plate placed on T12-13 and held by 4 screws; post-op CT scan.